I know that I just wrote about a new favorite polish (Formula X in Power Source) earlier this week, but I wanted to do a little round up of some of my favorite formulas and shades for summer! Revlon ColorStay Gel Envy in Wild Card (thumb): This is a beautiful cobalt blue shade from Revlon's newly reformulated nail polish line. The color is gorgeous and easy to apply (it goes opaque in just one shade). The formula didn't last super long without chipping, but that is typical for me. Essie Find Me an Oasis (index finger): Find Me an Oasis is a very, very pale light blue that is a great alternative to white. Because it is so light, it goes on a bit streaky, but evens out after two coats. L'Oreal Tangerine Crush (middle finger): Tangerine Crush is my all time favorite orange shade. It is super glossy and very flattering, even on pale skins. And the L'Oreal nail polish formula has better lasting power than a lot of the other drugstore polishes I've encountered. Revlon Scented Nail Enamel in China Flower (ring finger): China Flower is an absolutely beautiful cream red shade. It is hands down my favorite red shade that I own. The formula is also super easy to apply. Formula X in Power Source (pinky): I talked about Power Source here. The shade is perfect for the summer and the formula is epically long lasting. I also want to rave about the Nails Inc. Floral Effect Polish in Richmond Gardens. This is one of the most fun topcoats I have ever used! 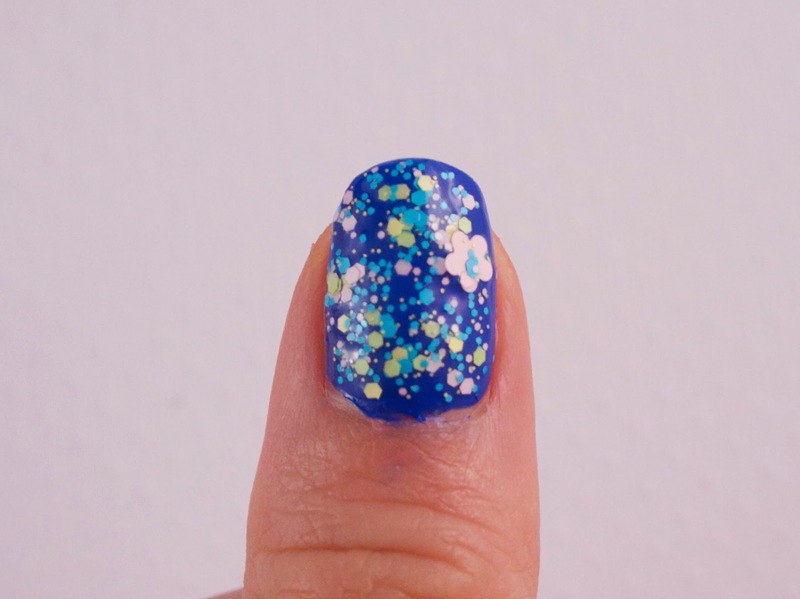 It is a mixture of both medium and small blue, green, and lilac dots, with flower glitters mixed throughout. 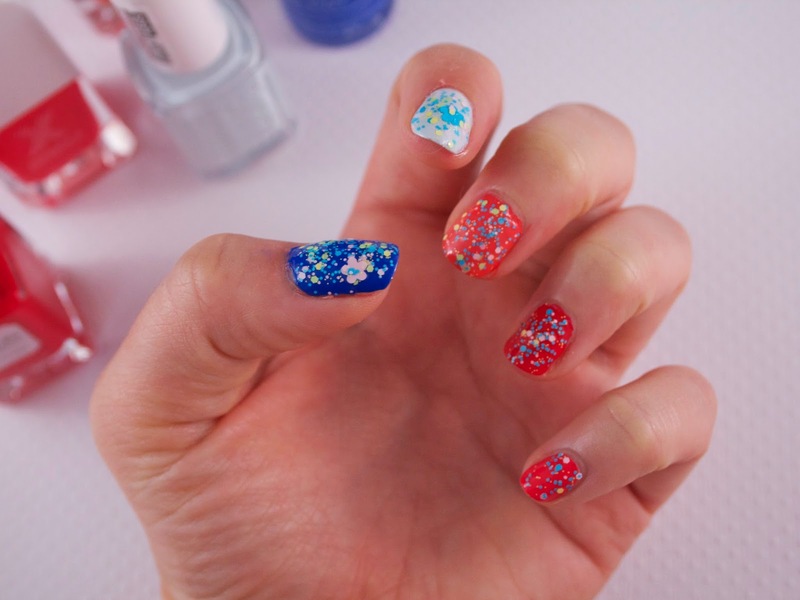 Even though it's fun and floral, I find it to be more sophisticated that traditional glitter topcoats, because it's more matte, rather than metallic. I think it looks great over each and every one of these polish colors, especially Revlon Wild Card. 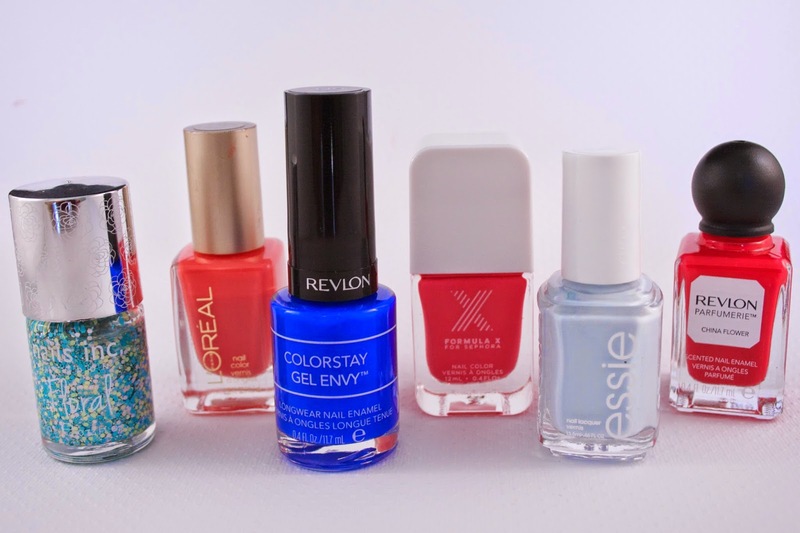 What polishes are you sporting on your fingers this summer? Let me know below!